I'm extremely pleased to tell you we have won a prestigious award. Frost & Sullivan is a global research and consulting firm and they recently announced that we received their 2017 North American Cybersecurity Awareness and Training Platform Customer Value Leadership Award. "More than ever, organizations need to protect their network environments and add their employees as a last line of defense "human firewall." Many cybersecurity awareness training and simulation platforms are insufficient and do not fulfill specific organizational needs. 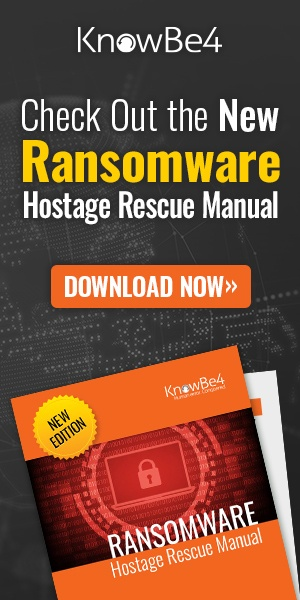 "KnowBe4 leverages its understanding of the behavior and logic of hackers and the way people retain information to create the most comprehensive, best-in-class platform in the security awareness training industry. 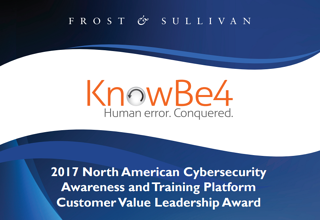 "With its customer-centric solutions, future-facing innovations, company acquisitions, and strong overall performance, KnowBe4 earns Frost & Sullivan’s 2017 Customer Value Leadership Award for its cybersecurity awareness and training platform." All of the KnowBe4 staff are grateful for this acknowledgement, and it only functions as more encouragement to provide you with the world's best-in-class platform at a surprisingly affordable price. Here is a copy of the 10-page PDF. If you ever needed some convincing material to add to your budget approval for security awareness training, this is powerful ammo. Cyber-attacks are rapidly getting more sophisticated. We help you step your employees throuigh new-school security awareness training to better manage the urgent IT security problems of social engineering, spear-phishing and ransomware attacks. Take the first step now. Find out what percentage of your employees are Phish-prone™ with our free test.